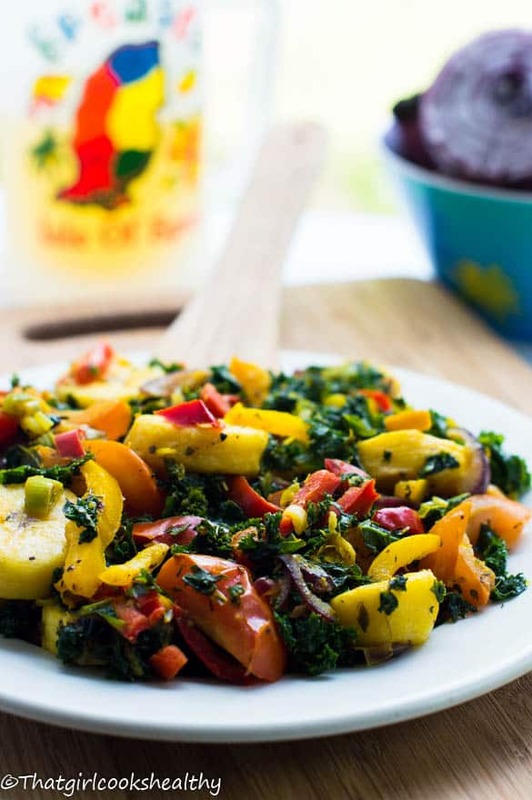 Boiled plantains with curly kale is a great way to jazz up what would be an ordinary lunch. 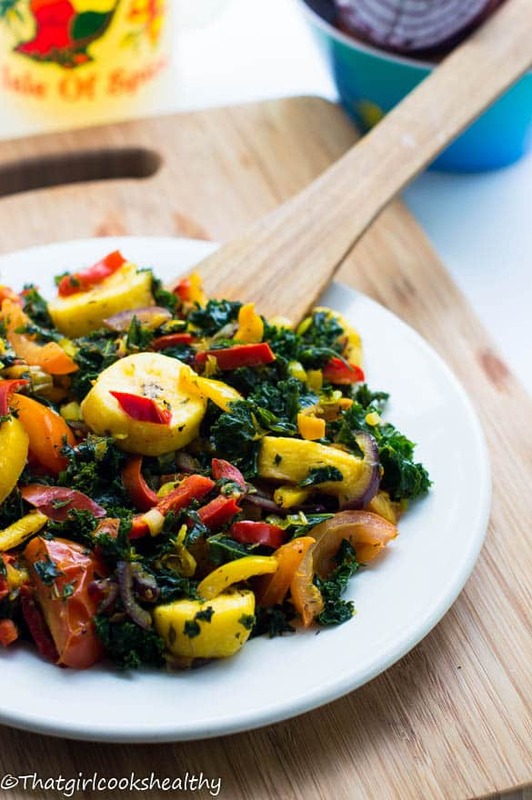 Healthy leafy greens combined with bell peppers. There’s something amazing about boiled plantains, I just cannot seem to get enough of them. I don’t think there’s a week that goes by without me incorporating this starchy vegetable (fruit but classified as a veg). What’s more, there’s a store right around the corner from me that certainly knows how to entice me. My fruit trolley is full to the brim right now with plantains courtesy of the little store on the corner plus the price is simply unbeatable. As long as this establishment remains replenished and fully stocked then Charla will make a regular appearance to purchase again and again. You’ll be pleased to know this recipe is super duper healthy and the plantain is boiled and not fried (YIPEE). What I did was boil the plantain with the skin on for roughly 20 minutes until tender. The key here is to yield tenderness and not achieve some type of mushy texture. When I first started boiling plantains to make this dish I winded up disheartened because the results would range from tender to mushy. Overcoming that obstacle presented itself as a challenge but I finally managed to perfect a fine balance between mushy and tenderness – boiling the plantain for 15 minutes. For me this seemed to be the most desired texture so keep this in mind as I summarise the meal. Can you boil plantains without the skin? Yes, I rotate between keeping the skin on and removing it depending on the recipe. You can remove the skin if you wish but I prefer to keep the skin on because I find I can gauge exactly how much time I need to boil the plantain a bit better. 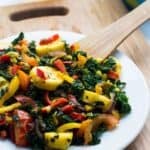 I wanted to pair the recipe with some callaloo which is an exotic leafy vegetable derived from the same family as spinach. However my vendor didn’t have any to hand and so I used curly kale leaves to substitute. You can follow suit and use kale or better yet spinach if you don’t have access to callaloo. The results using spinach are incredibly fool proof I’m just a bit more partial to my beloved kale right now. Yes, boiled sweet plantains are a nutritional powerhouse. They are an excellent source of fiber, complex carbohydrates. Contain vitamin A, C and B6 along with minerals such as magnesium and potassium. Although boiled plantains are more caloric, they host a multitude of health benefits . 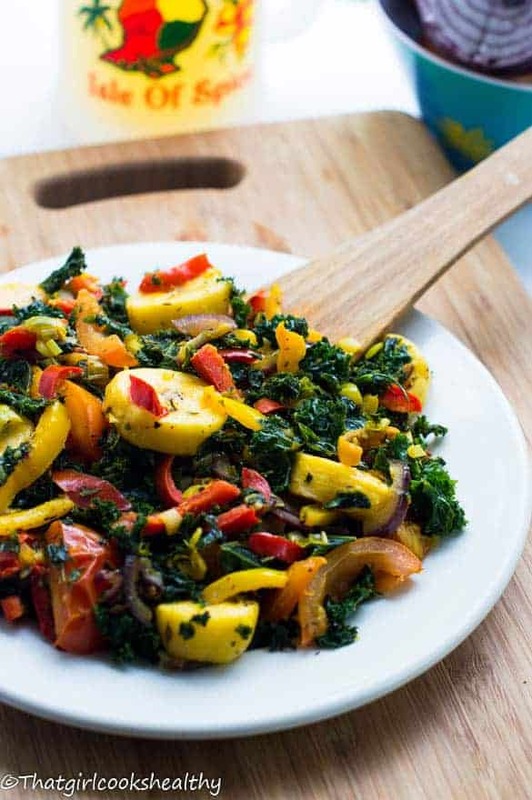 To balance things out with the starch enriched plantains, you’ll find a selection of low fat/carb veggies – red and yellow bell peppers, tomatoes, scallions along with the kale. Boil the plantain for roughly 15 minutes until tender. Once cooked drain off the excess water and allow to cool then cut the tips of the plantain and use a paring knife to make a incision length ways to remove the peel, it should come off with ease, then slice the plantain into little discs. Meanwhile on medium heat sautee the scallions/red onions to begin with in about 2tbsp of coconut oil for 30 seconds, then add the tomatoes, bell peppers and add the rest of the spices. Flip the pan to ensure everything is thoroughly coated before incorporating the sliced plantains and allow to infuse with the spices. The kale should be added lastly to cook for another minute and combine with the rest of the ingredients. I love plantains but have never had them boiled. Must give this dish a try soon! Thanks for commenting Johnna, definitely give this one a try. OOOO you make me want to eat KALE! LMAO! Glad to have converted you GiGi. what a beautiful coloured dish! I love kale and am always looking for new ways to use it in dishes! The boiled plantains is something I have never tried and now am inspired! Great post! Thank you for commenting. 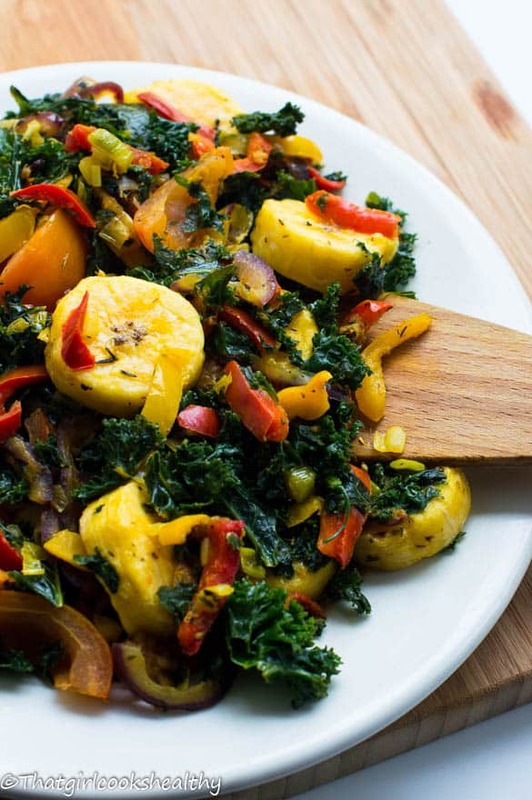 Boiled and roasting plantains are a common method of cooking within the Caribbean community, do give it a try and paired with kale makes it 10 times more awesome. This dish is a keeper! I made this with kale and sea salt, and boiled the plantains for 10 minutes. Your instructions were right on. Has a mild curry flavor without the strong scent. Thanks for sharing. I just stumbled across your website… very nice indeed. I am looking to change to a healthy diet and this seems to be just what i am looking for. Just one comment. It would be very useful if you were to include how many people each dish servers. Thank you for commenting Richard and I’m happy to learn I can assist you with healthy eating. I usually don’t include servings simply because this varies according to each person. This recipe is fantastic, wouldn’t change a thing! The plantains came out perfect, and so much easier than frying twice. Thank you, this is a keeper. I didn’t take any pictures because I was gettin a bit too hangry 😉 next time I promise! Thanks for the feedback Usnea, glad you liked it. This was absolutely delicious! And you were right about the boil time. Thank you Gianna. It’s my go to recipe when I’m in a rush. I certainly won’t judge you for making it every week! !